The aluminum c-clamp, Get-A-Grip™, is the strong and durable method of hanging your fixtures. 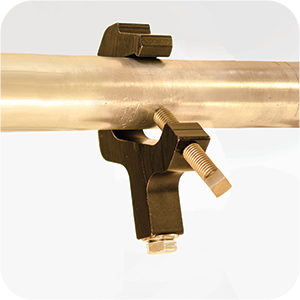 The 1/2" -13x3" square head pipe mounting bolt, along with the interior "teeth" of the clamp, bite onto pipe sizes ranging from 3/4" - 1 1/2" and tubing of 1" to 2" OD. This unit has a Safe Vertical Working Load of 600 lbs. Made from high strength, black anodized extruded aluminum. Weighs 1 lb. less than cast iron clamps, saving on shipping costs. Form-made threads for smooth backing in and out of yoke bolt.